Sorry if this blog is being overtaken by baby talk. But at this point, after a midwife check-up this morning where she thought the baby was weighing in at about 9 pounds, "baby" is about all that's on my mind. Well, baby and how hard it is to bend over and pick up toys, and put on my socks, and get the laundry out of the very back of the dryer, and roll over in bed to switch sides. You know, important thoughts like that. They say that as you go down the line, each child becomes less and less spoiled or something like that. Fourth baby. No baby shower. No registry. Using the same crib linens. The same outfits, the same car seat…But if this baby ever tries to whine to me about the woes of being fourth, I will gladly point him or her in the direction of these blog posts. Because if nothing else, this baby is being spoiled with knitted goods. I don't know if it was the Olympics, which provides the perfect background for knitting. 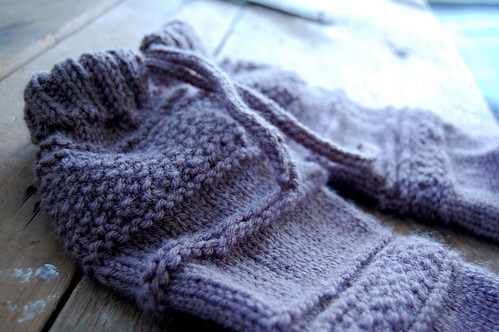 Or the winter pregnancy, or what, but I'm knitting more for this baby, then I have for any of my other children. The first fully finished project to come off my needles are these cute baby britches. I found them on ravelry–another dangerous place to hang out when you're expecting–they are the Kanoko Pants, and I loved knitting them. I also discovered something very important about myself as a knitter while working on them. I have always thought I was the kind of knitter who needed mindless, "knit while you watch TV" kinds of projects. But the changing patterns in these pants kept me interested and moving along quickly. I was always anxious to get the next section and before I knew it, they were done. It was such an enlightening experience! And it has completely changed what types of patterns I look at now. Now I just wish I had a cute baby bum to slip these pants over! I love the knitting! I so wish I could knit!Hope baby makes an appearance soon! I love the color of these-very pretty! And I am only about 3 months along but I can already tell that things like rolling over in bed just aren’t going to get any easier! Might I add one more pregnancy woe to the list? Frequent trips to the bathroom! Lol! I have become quite the night owl! Oh, I’m right there with you. I’m not due till mid April but was in hospital triage with contractions 3 minutes apart last night, so it’s all baby all the time here, too. It’s so funny that you knit those pants! I’m currently on leg warmers and have been busy trying to finish so I can start on those pants… they’re absolutely adorable. Here’s to spoiling children with knitted things! Adorable, Molly. Can’t wait to see a pic of the babe in them! Oh those are lovely! What a great project! Are you going to use them as a diaper cover type thing? or just adorable pants? Either way they are great, and I am bookmarking that pattern. I learned that same thing about myself knitting this winter- I’ve been knitting for years and always stuck with the least complicated patterns possible. But deciding to tackle one slightly more involved project really opened my eyes to how fun it can be to engage with the pattern that way. I don’t think I’ll be jumping into lace anytime soon, but it definitely broadens the horizons! I love them! 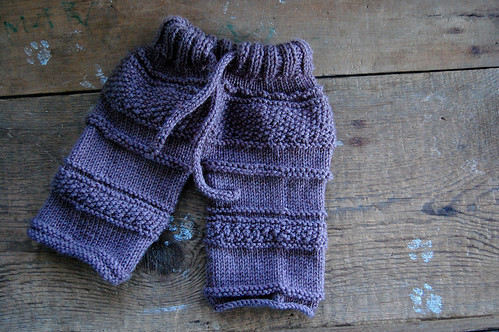 I’m knitting little pants too, and those are next on my list. My gauge was off on this pair, so I suspect they’re going to fit later than I intended. Sigh. I don’t know about you, but I am officially ready to be done with being pregnant and starting with the baby. Now if only I could get some cooperation! those take the cake for completely adorable! These are as dear as can be! Maybe for baby #2 (don’t worry, SO not even a twinkle in our eye yet!) I’ll learn (for the third time) how to knit? And I can’t believe how quickly I had forgotten how hard it was to turn from one side to another in bed. Amnesia about labor has not set in yet but apparently pregnancy amnesia has! i had a dream last night that you had the baby. and it was a boy. and somehow dan knew that before you delivered. Adorable pants!!! I’m glad I have some friends who are expecting so I can make a few pairs too! Thx for sharing them. I also have four kiddos (my youngest is now 3). Best wishes to you and yours!!! With us expecting our girl the end of May it’s been all baby around here too. The pants are beautiful, thanks for sharing! oh those are sweet! And why, oh, why do I read these posts! As though I don’t already want a baby so much it hurts! Having a, “I don’t want to be content!” day here! darling! and sooo comfy looking. perfect for a new baby. hey! this pattern is on my desktop right now! i downloaded it last week when i was looking for soaker patterns. (liked this one, by the way and have started on a second one. i hope it’s a good style for the babe.) your pants turned out great! i think i need some cute longies in the supply as i attempt to use wool diaper covers on this next little bum. Adorable pants! Thanks so much for directing me to the pattern!